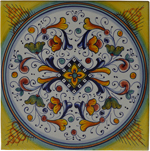 Deruta Italian Panel Tile - Ferrara Style - Green and Yellow on Blue - 4-piece at 7 in x 13-3/8 in x 1/2 in (18cm x 34cm x 1.25cm). 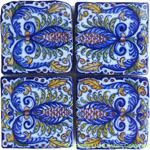 Each rhomboid tile is 7-1/2 inches per side. 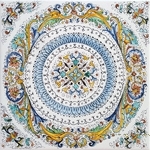 Total dimensions are 14 in x 27 in x 1/2 in. 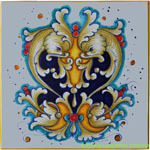 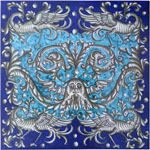 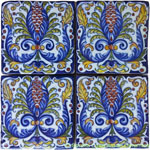 Deruta Italian Panel Tile - Firenze Style -Blue and Light Red on White - 4-piece of 6 in x 6 in x 1 in (15cm x 15cm x 2.5cm). 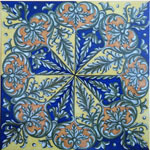 Total dimensions are 12 in x 12 in x 1 in (30cm x 30cm x 2.5cm).